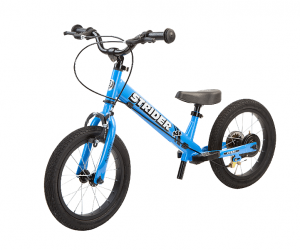 The Strider 12 Sport Balance Bike 2017 Model is a well designed and constructed balance bike with tonnes of accessories, a perfect fit for your budding biker from 18 months to 5 years old. It comes in Red, Blue, or Black. If you are searching for the full range of colours, head over to the 2018 Model page. The STRIDER 12 Sport Balance Bike 2017 Model makes a great choice for kids aged from 18 months to 5 years old. A tried and tested brand, these well designed and constructed balance bikes with tonnes of accessories are the perfect fit for your budding biker. Unique 12.7mm steel handlebar is 43% smaller than standard to allow better control with tiny hands. Mini-grips are soft urethane with protective ends. Machined-aluminum quick release clamps allow for ‘no tools’ height adjustment from 46-56cm (18-22”). Ultralight one-piece five-spoke design with 10 bearing support gussets for maximum strength at the lightest weight possible. Top-quality sealed cartridge bearings roll smooth and never need adjustment. 12 inch EVA polymer (industrial foam) tyres are super light and durable yet offer a smooth ride. They never need air and are puncture proof. The durable, all-weather padded mini-saddle is designed for beginning riders and their tiny hips. Smaller, narrower, and lighter than a typical saddle, this seat allows for proper riding position and posture. The Sport model includes an extra long seatpost which allows seat height adjustments from 28cm (11″) up to 48cm (19”) with a quick release ‘no tools‘ clamp for easy height adjustments on the go. Unique, patented frame-integrated footrests are properly positioned directly below the saddle for natural bike balance. This position also fosters the advanced ability to stand while coasting. This allows the addition of a foot-operated brake once the kids are proficiently gliding with feet on the footrests. Foot operated brakes sold separately in Bike Spare Parts. It’s not recommended to fit this initially as it’s safer for your child to learn to stop with their feet. 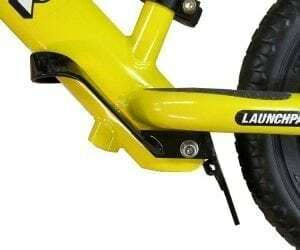 If the rider is a little older (3yrs +), stronger and can handle the added weight of the pneumatic system you can purchase a set of air wheels to swap with the foam filled tyres on your existing frame. Buy now from Bike Spare Parts. For beginning riders or really young/lightweight riders, we still recommend the standard EVA polymer wheel set due to its light weight. FREE Strider Cup Race Entry with every bike (Worth £15). Comes in Red, Blue and Black colours. Allows your child to develop their sense of balance, a key motor skill, and have bucket loads of fun at the same time. The transition to a pedal bike when they are 4 – 6 years old is a breeze without the need for stabilisers. Encourages outdoor play which enhances mood. They build leg, arm and grip strength which is so important for physical play and school readiness. The development of bi-lateral co-ordination (co-ordinating both sides of the body) occurs as they use alternate legs or both legs in unison to propel themselves forward. This encourages connections between both sides of the brain which is vital for future learning. Certifications | CE mark. Meets current EU & US toy safety standards. Safe riding should always include a bike helmet. Check out our range of high quality MET Toddler Helmets to protect your little ones. 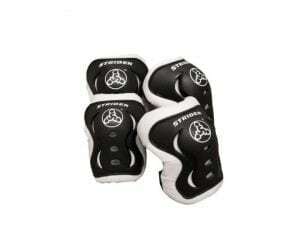 Knee and elbow pads and cycling gloves are available from Protective Gear if required.